Here’s a simple count to 100 chart for St Patrick’s Day. 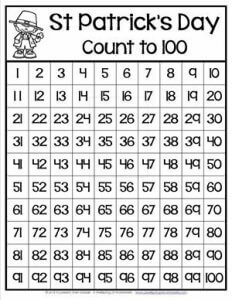 Having kids count together as they put their fingers on each number practicing their one-on-one correspondence skills while counting at the same time. Keep in the St Patty’s spirit and print this chart on green paper.